The opinion of Clement Greenberg, the doyen of modernist art criticism, was that photography is literary in that its concerns are history, anecdote, reportage and observation before they are pictorial. 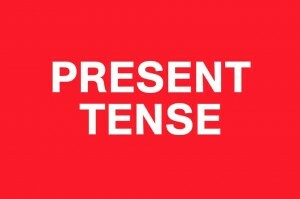 In other words, the photograph is about content before it is about form. In his essay, Towards a Newer Laocoön (1940), Greenberg proposed that the various arts had each sought self-definition through the progressive process of differentiation: painting, Greenberg’s main interest, defined itself by excluding that which was not integral to its nature; photography relied on content and consequently was unable to isolate its medium specificity. From this viewpoint, abstract painting achieved a purity of form, essentially becoming ‘painting about painting’; photography struggled to become ‘photography about photography’ and so failed in this quality that defines modern art. The pictures made by the photographer Tom Wood (b.1951) who trained as a painter, wrestle with this problem. His work has been valued primarily for its content rather than its artistry; looked at as document instead of picture. 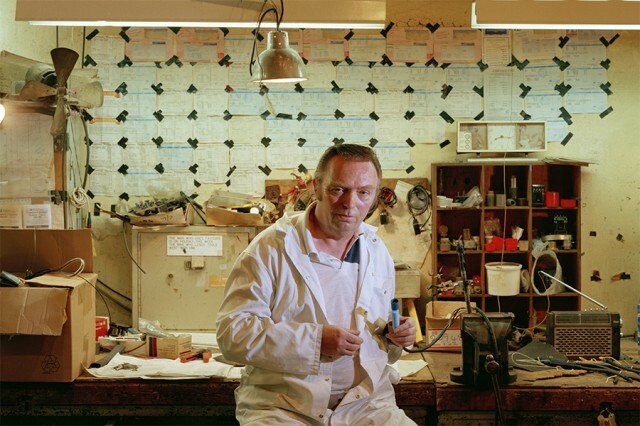 In 1996, Tom Wood was commissioned by the Manchester-based Documentary Photography Archive (DPA) to photograph Cammell Laird, the Birkenhead shipyard that had closed to shipbuilding three years earlier. The success of Wood’s application was based on his existing photographic project of Cammell Laird, and an earlier DPA commission to record Rainhill’s psychiatric hospital (1988-90). Both bodies of work are currently held in the Archive. In 2013, artist Cian Quayle organised for these commissions to be shown at Contemporary Art Space Chester (CASC) on the Art & Design campus at Chester’s University. Titled DPA Work, the two exhibitions incorporated contextual documentation – some of it drawn from the Wirral Archives Service in Birkenhead – and instigated Colin Simpson, Principal Museums Officer at the Williamson Art Gallery & Museum, to show the Cammell Laird project in Birkenhead. 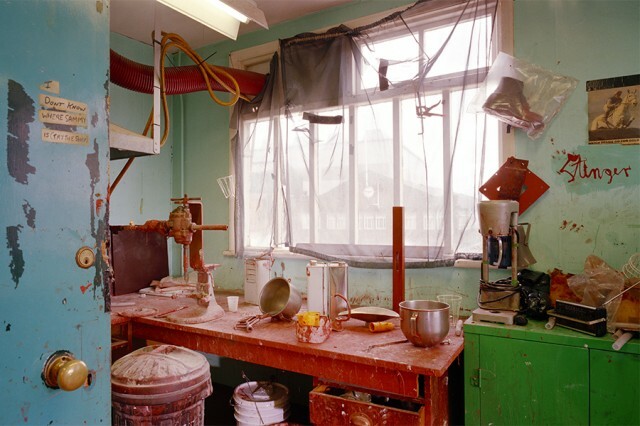 Simpson presented the exhibition, Tom Wood: Cammell Laird 1993-1996, in two distinct hangings, the first following a similar strategy in its play between contextual documentation and Wood’s photographs. This was complemented by a companion exhibition in the adjoining gallery space of an on-going project by Quayle that interweaves photographs, film and documents. Commissioned as documentary and framed by evidence from the archives, the Cammell Laird photographs are understood primarily as literary and not pictorial. This reading is reinforced by the affection his pictures receive on Merseyside. These are photographs of Merseysiders who Wood has photographed at play in the nightclub (Looking for Love: Photographs from Chelsea Reach Nightclub, 1989); travelling on the bus (All Zones off Peak, 1998), and ferry (The Pier Head, 2018 Open Eye exhibition); or at work. Wood knows these people and they know him: he is their ‘Photieman’. Two middle-aged men are in the workshop, both dressed in blue overalls, they face the camera and are easily recognizable. They are the men who live down the street: a friend, a father, an uncle or a granddad. This is how many viewers of the Cammell Laird exhibition will relate to Wood’s pictures. 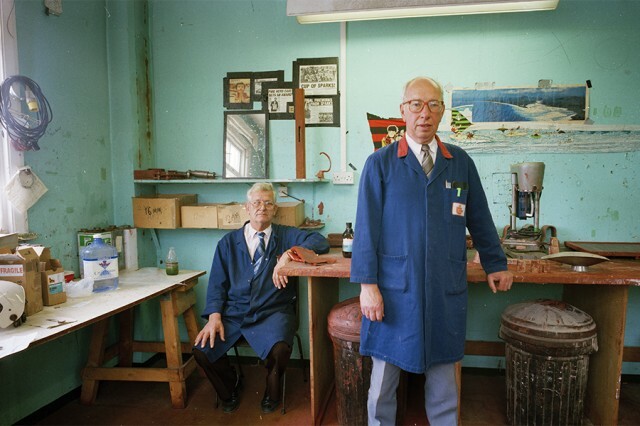 During 2018, Wood’s photographs taken of New Brighton’s seaside resort were shown in the Sailing School at New Brighton overlooking the seafront (New Brighton Revisited, presented by Northern Narrative and the Open Eye Gallery); and his images of football supporters in Liverpool formed part of the exhibition Common Ground shown at the Royal Albert Dock (organized by Foto Octo). These projects provide a comprehensive overview of the population and, as such, function as document. A number of Wood’s pictures of Cammell Laird are unpopulated, the presence of a figure sometimes incidental. 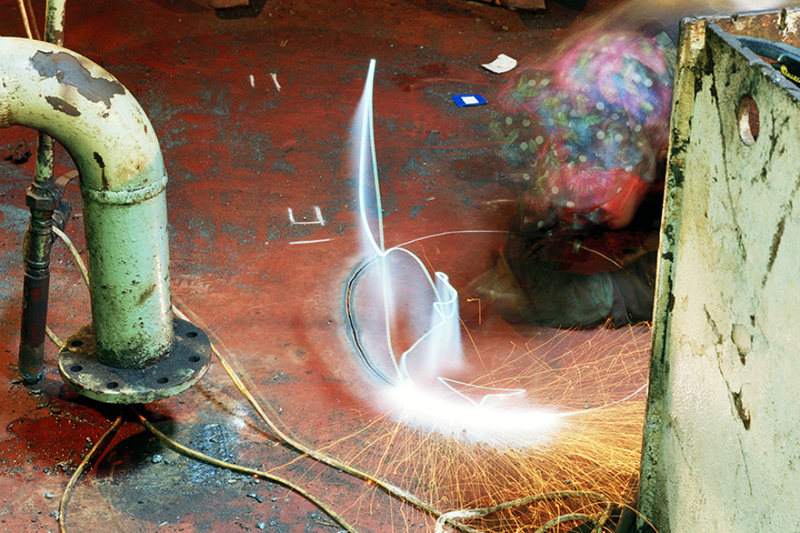 Vacant workshops, and the bright light of welding and cutting gear, contrast with the chronicle of faces of the shipyard’s workers providing an abstract counterpoise to the figuration of portraiture. A second hanging of the work in a reduced form, and resurrected in a different gallery space immediately off the main entrance, shifted the exhibition’s emphasis. 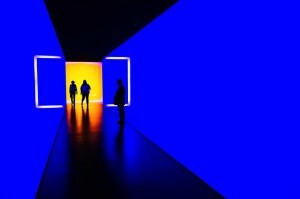 The viewer now becomes aware of vivid colour and intensities of light. These could be photographs about photography – at least its properties. In turn, this observation can be reflected back on to Wood’s portraits, not merely showing us men but also highlighting colour. The two men in the workshop are in a turquoise field, their blue overalls are blocks within this composition. The action of an arc of light takes on the character of an action painter’s gesture, but this actor uses light, not pigment, and the suitable medium is one whose substance is illumination. The emphasis on colour and light are two of the essential features of Wood’s photography that differentiates this work from documentary and distinguishes it from the opacity of painting. Turning around Greenberg’s criticism that a photographic surface is looked through rather than looked at, it can be said that in the compositions of Tom Wood the picture plane has value in itself. It is apparent that Greenberg’s statements are now dated – part of a particular moment in Fine Art discourse – challenged by Minimalism and Pop Art, and then made irrelevant in regards to the hybrid forms of Conceptual Art that laid emphasis on the cerebral. Since Conceptual Art, photography has been integrated into a composite that explores the subject. This approach can be applied to the display of the Cammell Laird exhibition that requires the visitor to consider Wood’s photographs and the contextual additions as a whole. The concept to which they contribute is the artwork. This aligns to a contemporary view of Fine Art. On a more traditional note, Wood’s individual pictures forcefully enact a concern with pictorial values where history, anecdote, reportage and observation are contingent upon the medium. Simply, Tom Wood’s photographs are about photography. Tom Wood: The DPA Work is due to be published next month by Steidl/University of Chester. Edited with text by Cian Quayle. Women’s Market: Tom Wood is published by Stanley/Barker, 2018.